When Jubilee Media asked us if we would be willing to film an episode of "Between Worlds" for their very popular YouTube channel (check it out -- lots of interesting videos in which they bring people together), we were intrigued. A little apprehensive, too! After all, they would be filming us collaborating with another artist, completely unknown to us until we walked into the studios! Here's the result! Spoiler: We absolutely loved working with the lovely, talented ladies of Mariachi Lindas Mexicanas! We recently had such a blast recording Sweet Child O' Mine by Guns N' Roses! It's an iconic song, and the band has millions of fans all over the world. We knew that we wanted to keep our version as faithful as possible to the original song -- an homage to the band from these four fans. We've heard some string quartet versions that omit Slash's solo; we wanted not only to keep it, but to attempt to capture the raw musicality of it. We think Shawn nailed it, but we want to know what you think -- please leave a comment and let us know! You can hear the entire full length video, here, or on our Videos page! All of us at Cattus Quartet (including Sal, our little party animal, pictured here) wish everyone a very happy and healthy 2017! We spent some of the last days of 2016 rehearsing for some new videos that will be released very soon in the coming months. Stay tuned! Looking ahead to the rest of 2017, we decided to publish some of our goals for Cattus this coming year. We are always striving to improve our business and the services we offer, so we wanted to give you an inside look into the direction we hope to take Cattus Quartet in the new year! 1. Develop relationships with local animal welfare organizations: Initially, our focus was to support organizations that received the highest ratings on Charity Navigator -- we wanted our money to go to charities that would make use of it in the most efficient possible way. But over the course of talking with clients, audience members, colleagues, and volunteers that we have met through Cattus, we learned about a few organizations that do wonderful and much needed work for animals and pets in need at a local level. But they are simply too small to receive a rating on Charity Navigator. So we will start adding those charities to our list of organizations that we support in the coming months. 3. Put ourselves out there: As with dating, we want to put ourselves out there in the hopes that you will see (hear) us! We are on the internet, and you see us in our videos, but we know that to truly to get to know us (and feel comfortable hiring us), you might want to hear us live. We are talking with some cafes/restaurants about performing some live shows, so stay tuned! 4. Our clients, our friends: Our last goal is the most important to us. We will continue to put you, our clients (and many of you who have turned into friends), first. We love performing for you on your wedding day, at corporate events, museum functions, birthdays, and beyond. We are so grateful for all the referrals we have received from past clients that have enabled us to meet and work with awesome new clients. And we cannot wait to serve you in 2017. Happy new year, from Cattus Quartet! Recently, three of our four quartet members spent a glorious 75 minutes with about a dozen shelter cats at Crumbs and Whiskers, the new cat cafe here in Los Angeles. All the cats at Crumbs and Whiskers come from a local shelter, Karma Rescue, and they are fostered at the cafe until adopted out by their "furrever" human (spend enough time at C&S, and you will pick up some cat-centric words!). Hermione was on Billy's lap for approximately 74 of the 75 total minutes spent inside the cafe. Perhaps she sensed a kindred spirit in Billy, who also enjoys naps (and sleep in general). Cattus is already planning another trip back to Crumbs & Whiskers! It was the purrr-fect way to spend an afternoon -- relaxing with cats, coffee, and friends. We've noticed a wedding trend that we absolutely love: pets that help you say, "I do." For Los Angeles-based wedding planner Lisa Gorjestani (of Details Event Planning), pets have been a part of her work for the past dozen years. She told CNN that, aside from providing food and water and other basic necessities, she uses peanut butter as a special treat to keep dogs in line on the big day. If only the answer were as simple as peanut butter for every one of your guests! Martha Stewart has some quick tips for including pets in your wedding. Buzzfeed has an amazing gallery of photos showing different couples with rabbits, pigs, and snakes. Yes, snakes! And please read more about how Cattus Quartet donates to organizations dedicated animal welfare. 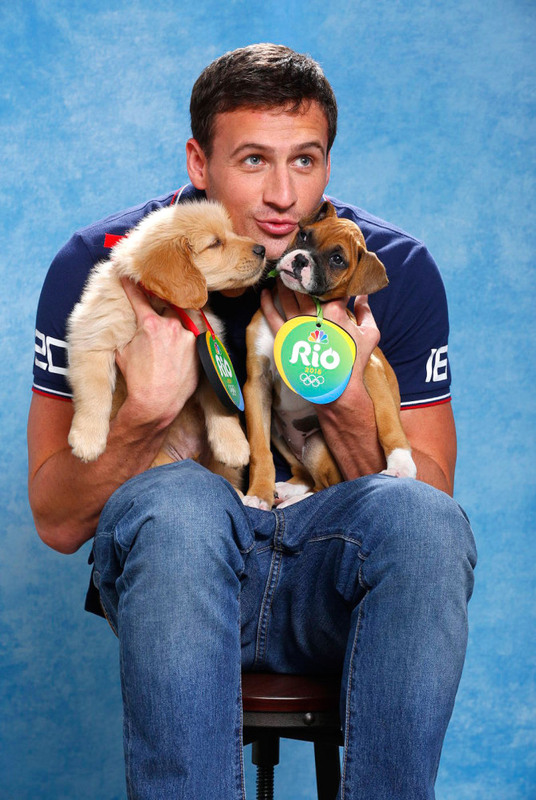 Michael Phelps might have won four gold medals in Rio, but these puppies just win, period. 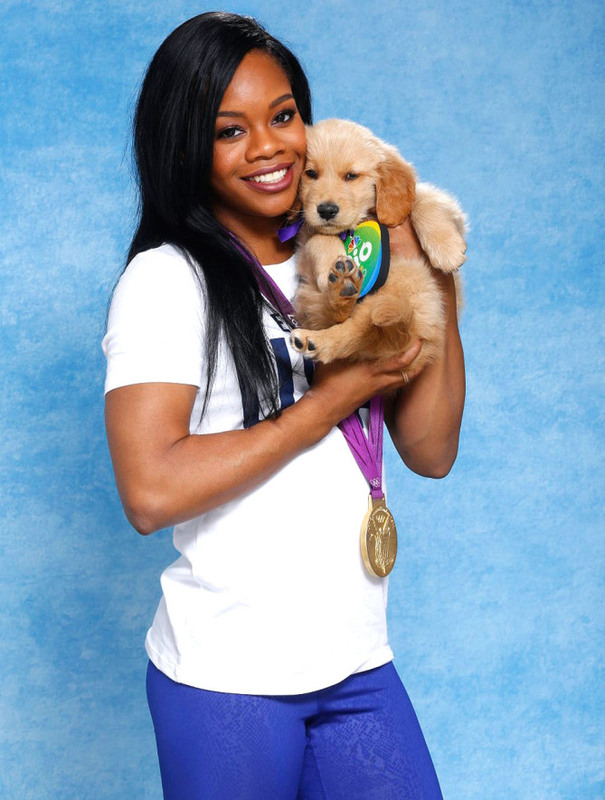 They teamed up with a few of your favorite Olympic athletes for a photo shoot to promote NBCUniversal's second annual Clear the Shelters campaign, a nationwide pet adoption drive that took place on July 23rd. The event paired 40 local NBC and Telemundo television stations with about 700 animal shelters for the day-long event. Last year about 20,000 pets were adopted! Take a look below at some of our favorite photos! All of the dogs pictured came from Southern California shelters, and they were all adopted following the shoot. Aly Raisman deserves an extra gold medal of her own.....she adopted the dog she was matched with for the photoshoot!